As a Game Master who’s been involved in games in the Golarion setting for at least four years, I have always found the concept of Hellknights fascinating. Oppressive knights of order who meet out justice according to the letter of the law. The rules for playing a Hellknight were published in Pathfinder Adventure Path #27 “What Lies in Dust” and present the Hellknights as a prestige class. Prestige Classes, however, are clearly against the design philosophy of the Pathfinder Roleplaying System. Instead Pathfinder presents two ways to vary core classes within the rules to better customize them to your character concept: those two customizable options are customizable options inherent in the character class itself (orders for Cavaliers, bloodlines for Sorcerers, etc) and Archetypes. Between these two rule features, one should be able to customize one of the core classes to be whatever one wants to represent- in this case, the Hellknight. Unfortunately, none of the orders really strike me as appropriate to Hellknights. So I came up with this “Order of the Hellknight” for my own game. I am presenting it here for feedback and general consumption. I took one liberty with this and actually changed one of the features of the base class- that of the Banner. This would technically make this an Archetype. But you can simply disregard this switch and use the Order of the Hellknight as you would any other order and it still works fine. Once every couple of weeks, myself and a group of like minded gamers get together to experience a fantasy version of Africa. Put another way, we get tother to play Paizo’s Pathfinder “The Serpent’s Skull” Adventure Path. 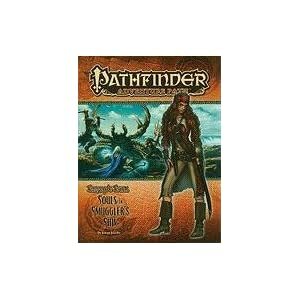 The Pathfinder Roleplaying Game is an outgrowth of the old Dungeons and Dragons RPG and many would argue (myself included) that it is the purest incarnation of the original Dungeons and Dragons rules set and flavor. I am part of a gaming group that get’s together routinely to play Pathfinder, and this is the third “Adventure Path” which we are attempting- my second at Game Master. Amongst the Adventure Paths (which are a series of adventures designed to take a group from level 1 to level 12-15 or so), the Serpent’s Skull is one of the more maligned of Paizo’s Adventure Paths and has gotten little third part love. I must confess I started the Adventure Path with rather low expectations. Our player group had dwindled down due to natural attrition so, with the help of our recently formed Meetup.com group I started the new path. I got a huge response, and we thought of dividing the group into two based on factions (which Serpent’s Skull naturally provides). Thus far, however, our group has hovered around the 6-8 range which is not quite enough two run two groups of 4 with 2 GMs. However, I did involve one of the other players as a co-GM. Well it turns out that this combination of Rick running most of the combats and breaking in some new players who had never played Pathfinder before caused the combats to be rather deadly. It didn’t help that the Serpent’s Skull AP had some very tough monsters. The AP started ship wrecked on a deserted island which was occupied by cannibals that were level 1 Barbarians with a strength of 18. With opposition like that, low level characters can start dropping like flies. We are now on our 10th session, and so far we have been averaging 1-2 PC deaths a session. A series of adventures this deadly is certainly not for everyone, and we’ve had some players never come back once their character died. For others, however, they found they enjoyed the challenge. They would sit down a player new to Pathfinder with a sub-optimal character, have it die after a few sessions, and return with a better optimized character. This only added to the Darwinian “battle of the fittest” theme which was present in the AP anyway. We just started Paizo’s Serpent’s Skull Adventure Path. Over the last couple of years my group has finished the Counsel of Thieves AP, and almost completed Kingmaker before we had to put the game on hold because the GM got too busy. So now the baton fell to me once again to run something. I decided I’d run the Serpent’s Skull AP, because I was already familiar with the material. In general I liked the flavor of the AP: an expedition into the dark heart of Mwange (fantasy Africa) to explore a lost city 1000s of years old. It beats your typical dungeon crawl in terms of flavor. Next weekend we are going to try our first player versus player scenario. We are going to organize into teams with whoever shows up and go at it. You have to make a character using the Pathfinder Core Rulebook and you have 20,000 gp to spend. Rick, the GM running it added the further condition that one shot items costs 5x as much since most one shot items have far more importance when the entire scenario is guaranteed to play out in a single battle. Player versus player (PvP) is a setting I’m inherently comfortable with. I was never one to generate a multipage history for a new character, but rather one to show up as one of several already explored tropes. PvP is where we leave the RPG behind and go back to the game’s miniature war game roots. These characters don’t really need a story, in fact, they don’t even need to make sense, like a Wizard with no Spellcraft. It’s just a miniatures war game at this point, and there probably won’t be a lot of uses of Spellcraft in the coming battle. Take Sparky, the Sorcerer I just put together. He’s a Sorcerer, but Charisma is not his highest stat. That’s because he’s going to attempt to break precisely two spells in this battle: Shocking Grasp and Scorching Ray. Since neither spell allows a saving throw, having a high Charisma doesn’t really benefit me. So I gave him a 14 Charisma so that he would get his two bonus spells and left it at that. No, what this character needs is the ability to make his to-hit roll to inflict a lot of damage on an opponent, which means he needs lot of Dex. We are using Epic Level point buy in the Core Rulebook, so I gave Sparky the following stats: S7, Co15, D18, I14, W8, Ch12. Since we start at level 5, I can use my one point increase to move Con up to 16. Now if I make him a halfling, his stats become: S5, Co16, D20, I14, W8, Ch14. Perfect! Note: I gave him a high Int, because it gives a AC bonus to my Spectral Hand spells. Since I’m really trying to break Shocking Grasp, I’m going to make him a Draconic Bloodline Sorcerer and chose a bonus with electric spells. This will mean that my Shocking Grasp does 5d6 +5 points of damage, for an average of 23 points. Now I’m going to spend the 20,000gp on two Metamagic Rods of Empower, which allows me to cast six spells and shell out damage at a 50% bonus. So now I’m looking at 5d6x1.5 + 5 = 5x(3.5×1.5) + 5 = 28.25 points of damage per casting. Combine that with Spectral Hand, and I can hit a target at a range of 150 feet with one Empowered Shocking Grasp every round. The theoretical maximum of a PvP character would be a Barbarian with an 20 Con (24 when ragging) for 76 points. Assuming said Barbarian charged me starting at 150 feet and moving 80 a round, he would be dead on the third application of Shocking Grasp. When means he would get precisely one swing at me before he went down. Most characters aren’t going to have nearly that many HPs, and so two rounds of Shocking Grasp should clean their clock. To help me in the hitting department, I took the feats of Weapon Finesse, so that his Dex applied to his natural attack rolls instead of his strength, as well as Weapon Focus (Natural). So, when it’s all said and done, if the character is wearing metal armor, I get a +3 bonus for the Shocking Grasp spell, a +2 bonus for Spectral Hand, a +5 Dex bonus, a +1 Weapon Focus bonus, and a Base Attack Bonus of +2, and my +1 size bonus for being small, which equals +14 to hit, and that’s on a touch attack! MUHAHAHAHAHA. The Alchemist is one of the more flexible character classes in the Pathfinder RPG: his extracts function as spells, his bombs function as arcane blasts that ignore Spell Resistance, and he can function as a skill monkey whose talents can include finding and disarming traps. The class is so flexible that Ogre proposed three distinct builds for the Alchemist: a bomb thrower (Dr. Strangelob), a melee build (Mr. Hyde), and a poisoner build. I’ve only played a bomb specialist, but I found that there were enough feat and discover spaces left over to add a separate element to the character. I decided to go with the poisoner, because certain feats the bomb chucker would already have such as Point Black Shot and Rapid Shot or Two-Weapon Fighting, would have natural synergy with the poisoner. I decided to go with the Two-Weapon Fighting model instead of the Point Blank Shot and Rapid Shot model because it’s very difficult to make use of the sticky poison discovery when dealing with ammunition. They only way around it would be to use multiple daggers of throwing, but coming across such things in a Pathfinder Society setting can be rather daunting. In order to maximize the effectiveness of poison, you need to hit the target multiple times in a round. Each hit adds a +2 to the DC save versus the poison and increases it’s total duration by half. The sticky poison discovery, meanwhile, allows one dose of poison to be stretched to a number of hits equal to your Intelligence modifier- which is quite a cost saver for the poisoner. Pathfinder has increasingly become my roleplaying game of choice; there is also a growing division between those players who prefer its Adventure Paths (geared toward smaller groups in a home-setting) to its ‘Society’ games (designed for the typical one-shot run at a gaming convention). Breaking it down, Adventure Paths are written to tell a coherent storyline over the effective lifetime of your characters — which, for most Adventure Paths, is level 1 to around 12 or 14. Society games tend toward a similar character lifetime (levels 1-12), but are instead a series of adventures which return the character to an episodic stasis at the end of each adventure. Not surprising, these adventures tend to lack the expected niceties of an overarching plot, or even recurring NPCs, though, you’re often playing these adventures with a different assortment of players from one Society game to another. I begun hosting Pathfinder Society games at my home in order to meet new Pathfinder players, the ultimate goal being to find those who would be interested in engaging in a more regular Adventure Path game. Surprisingly, to me anyway, I came across some exclusively interested in Society games. It seemed the main appeal there was the official nature of the Society game: requiring the GM to register each section online plus filling out a Chronicle sheet for each player that specifically documents their progress over that adventure. This allows the player to attend a convention and play an officially sanctioned character (which he or she has played before) that has been built up over the course of several adventures. For some players, it would seem this engenders a sense of accomplishment; if the Pathfinder session in which they’re currently playing (read: Adventure Path) isn’t furthering this official standing of their character — they just aren’t interested. I was really unhappy with the character sheet included in the new Gamma World game. The new Gamma World is clearly attempting to dummy down a RPG into something that is more akin to a board game, and I support that. However, in their effort to make the game seem easy, they made a character sheet that just doesn’t have room for enough information on it. So I threw this one together. It’s a rough draft right now, because I don’t have time to clean it up until I get back in town from Texas for Christmas. Oh yea, and I’m getting married on New Year’s Eve as well. Anyway, if anyone’s interesting in evaluation this rough draft character sheet and providing me with any suggestions, feel free to leave comments. No sooner had I figured out that math behind 4d6, drop the lowest, then it seems I was confronted with the gamer practice of rolling 4 six sided dice, re-rolling any 1s, and then dropping the lowest score. One gamer decided just to take my 4d6 math and convert it to 4d5 math figuring that re-rolling 1s meant perpetually re-rolling 1s. Of course, as I asked in the thread, if you’re going to re-roll a 1 every time you get it, why on Earth are you rolling a six sided die to begin with. The dice bag of most D&D/Pathfinder players tends to have more dice than they know what to do with. Wouldn’t it make more sense to just roll four 5 sided dice (which really means you roll a 10 sided die and divide it by two, rounding up) and then add 1 to each die’s result. Doing so would give the same results as 4d6 with a perpetual re-roll and would not involve the seemingly tedious step of re-rolling anything. Simple enough. But what about the problem of 4d6, single re-roll 1s, and drop the low result? We know for last time that there are 1296 possible combinations of four six sided dice. When we single reroll a 1 result, we still end up with 1296 possible combinations, we’ve simply weighted some more heavily than others. In the problem with a single re-roll of a six sided die, a 1 is still a possible result, it’s just much less likely than any other possible result. Similarly, I figure in the 4d6 problem that there are still 1296 possible results, but we just need to weight them differently. It’s still possible to get a result of (1,1,1,1) on four six sided dice, it’s just much less likely than (6,6,6,6), but how much less likely? Well, we can see from the six sided die result that getting a result of a six is 7 out of 36, whereas a 1 is only 1 out of 36. If we compare the two probabilities by dividing the chances of the 1 result by the chances of the 6 result, we get 1/36 divided by 7/36, which simplifies to 1 in 7, or .14286. That is, you are the comparative probability of getting a 1, rather than a six (or any other score) is .14286. So if we take an array or results and we weight all the results with 1s by .14286, we should get the results of the array weighted so that 1s are far less likely. Let’s take a look at a single six sided die’s results to check our work. A six sided die has an equal probability of generating a 1,2,3,4,5, or 6. Each has a probability of 1 in 6. If we multiply the 1 result by 1 in 7 (or .14296) then, we get the following table. The problem here is that the probabilities do not add up to 1 anymore like they are supposed to, but we can re weight them by adding up everything and dividing each probability by the sum. If we add up all the probabilities above, we get 5/6 + 1/42, or 35/42 + 1/42 = 36/42 or .857. If we now divide each probability by the sum of 36/42, we get the re-weighted probability in the column in the table above. Voila! The re-weighted probability is exactly equal to the original probability we calculated in the first table. Here’s the data that went into generating this graph. Unlike most other roleplaying games, Dungeons and Dragons and recently spun off Pathfinder RPG allow for multiple ways to generate your characters starting characteristics. A point-buy system has become the most popular way by most players because it will result in each player having a starting character that is roughly of the same power level. This is a concern for a lot of gaming groups because the games they play are dominated by combat (which chews up quite a bit of game session time per encounter) and players tend to feel resentful if one player is significantly outshining the other players in terms of body count. In more social games, I think disparity in character power levels doesn’t mean as much. If we are roleplaying out Bilbo Baggins’s birthday party does the difference in power level between Gandolph and Samwise Gamgee really matter all that much? Personally I’ve discovered that I tend to enjoy game sessions where characters tend to be subpar and the power levels are asymmetrically dispersed. First off, it’s a bit more real because not everyone brings equivalent skills to the table in life and why should games that imitate life be all that different. Secondly, something about rolling three six-sided dice (which is abbreviated 3d6 in gamer notation) and having those dictate what your characters scores are in the exact order in which you role them disconnects you from your character. If you’re using a point buy system, or even a method of assigning the stats in the order you like, you become invested in your grand design for the character. Having luck determine what your character’s stats are reinforces that you are not designing this character but instead being asked to play a character who is very different from you and, for that matter, very different than you might have preferred.